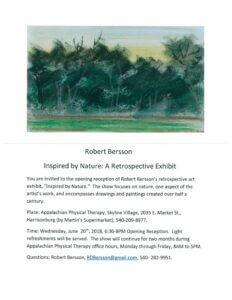 Our next featured artist in our Harrisonburg office is Robert Bersson. Robert and the staff of Appalachian Physical Therapy will be hosting an opening reception of his retrospective art exhibit, “Inspired by Nature.” This exhibit focuses on nature, just one aspect of the artist’s work, and encompasses drawings and paintings created over half a century. 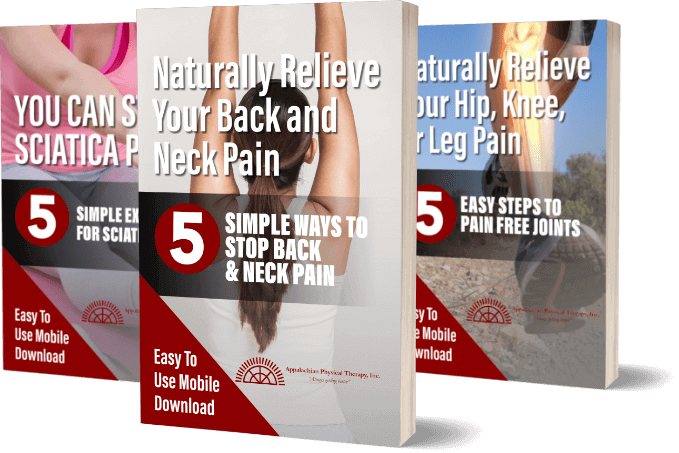 The reception will be on Wednesday, June 20th, 2018 from 6:30pm to 8:00 pm at Appalachian Physical Therapy in Harrisonburg located in the Skyline shopping center between Martin’s supermarket and Kohls department store. Light refreshments will be served. If you are unable to make it to the show but would like to view Robert’s Artwork, it will be on display for two months and can be viewed during normal business hours, Monday through Friday, 8am-5pm. For questions, please contact Robert Bersson via email RDBersson@gmail.com or by phone (540)282-9951.